More than two years ago, I wrote a post showing how Oklahoma outpaced all the states on a per-capita basis in its declared disasters by the Federal Emergency Management Agency. In fact, right now, only Texas at 86 and California at 78 have more total declared disasters than the 74 that have been declared in this state since 1953, according to FEMA records. When you compare the difference in our geographical and population size with Texas and California, the numbers are simply mind-boggling. Three years ago, I wrote a commentary in the Oklahoma Gazette that argued state leaders needed to at least discuss the idea to require storm shelters in new home construction and build more community shelters. On Friday, in an Op-Ed in The Washington Post, following the destructive May 20 tornado that killed 24 people, injured more than 300 and destroyed 1,200 homes, I again called for more storm shelters in the ground, stronger building construction, at least for our schools, and deeper inquiries into how climate change might be affecting our weather. Some people will argue that it’s too early for these types of discussions, but I say they are long past due, and now is exactly the time to consider how to make this a safer place to live. So many people here have rallied around the storm’s victims after the fact of the tragedy, but where were they, where were all us, before the tornado hit? We were in denial when it comes to our weather. I brought up the FEMA declarations, which you can find here because they prove this is an extremely violent place to live and that taxpayers outside of our state repeatedly help us foot the bill. Associated Press writer Seth Borenstein brings up one telling comparison that the FEMA statistics show. He writes, “Oklahoma County has been on the disaster list 38 times, more than the entire State of New Jersey.” Don’t think these types of facts are lost on East Coast residents. To make it worse, U.S. Sen. Jim Inhofe actually voted against federal aid to help communities on the East Coast after Hurricane Sandy in 2012. Now, U.S. Sen. Tom Coburn wants federal offsets for any funding for the Moore and Oklahoma City-area tornado disaster relief. In other words, it could be conceivable that Coburn would vote to cut programs affecting East Coast communities to pay for our lack of weather-disaster preparation here. These guys might be considered heroes here by the local, corporate media, but they are highly criticized outside the state. Let’s be clear once again: Despite all the anti-government rhetoric and the anti-President Barack Obama fixation among conservatives here, this state is highly dependent on the federal government for its viability and, due to its weather disasters alone, its real survival. This is nothing to be ashamed about-we do live in Tornado Alley-but it does mean we need to get smarter about how to prepare for severe weather for not only ourselves but also the entire country. Instead, we send out the wrong message. A CBS story points out that the Oklahoma City area has been struck by more tornadoes than any other city since records have been kept starting in 1893. Yet the same story contains remarks from graduates of Moore schools that essentially boil down to this: Weather stuff just happens. We’re going to stay put in Moore. I realize how some younger people want to feel “normal,” and with the national spotlight bearing down on Moore residents, young or old, that’s pretty difficult for anyone there to do right now. My intention is not to criticize any one individual but to get at our group-think, which hurts us. Maybe we shouldn’t rebuild in those damaged areas in Moore, which in recent years has been severely hit by tornadoes on May 3, 1999, May 8, 2003, May 10, 2010 and now May 20, 2013. The new, replacement homes could be built in other areas. Maybe it’s time for a massive effort to build storm shelters and to build stronger, public buildings. 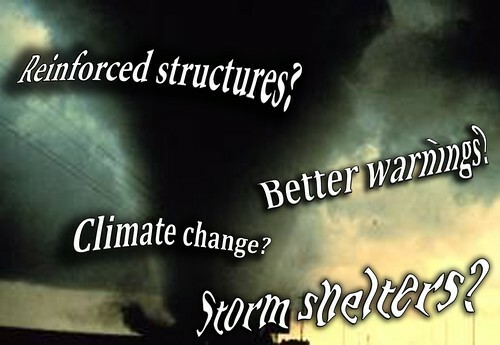 Maybe our “shelter-in-place” strategies are outdated and need to change. Let’s do something different.